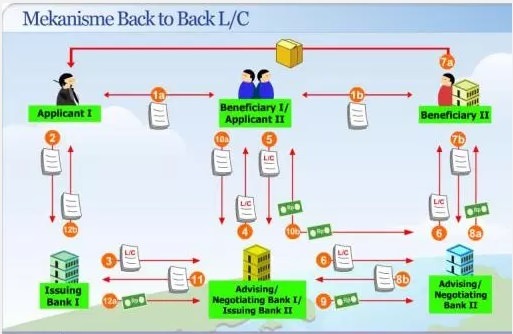 BACK TO BACK L/C is a which is backed by Export L/C or Master L/C. 1. Ready-made garment industries and specialized Textile units have been allowed the facility of importing fabrics and other materials needed for the manufacture of garments/ specialized textiles, free of duty under bonded warehouse license system against back to back L/C arrangement, without involving cash foreign exchange from Bangladesh sources. The Bangladesh Bank has, therefore, allowed the ADs to open back to back L/C for importing of raw materials by the Readymade Garments Industry/Specialized Textile Units, to carry out their export orders against export L/C. The branches should follow in this regard, all the usual exchange control and trade control regulations as required in case of opening normal Import L/C. Wikipedia says: In international trade, “exports” refers to selling goods and services produced in the home country to other markets. Export of commercial quantities of goods normally requires the involvement of the customs authorities in both the country of export and the country of import. Business dictionary defines export: To send goods or services across national borders for the purpose of selling and realizing foreign exchange. The Government of Bangladesh has advised a special procedure under which the export-oriented garment units are allowed to import their raw materials free of duty under the bonded warehouse arrangement. Back-to-Back letter of credit, in essence, is used to import the inputs generally on credit terms up to 180 days on the strength of the foreign LC received from the overseas buyers. When an L/C is opened to import goods directly from the exporter is called master L/C. This L/C is issued by the buyer (Buyer’s bank) to the manufacturer. Master LC has higher financial value than back to back L/C. When an L/C is prepared by the manufacturer to collect raw materials for production from the suppliers is called Back to Back L/C. Back to Back L/C has 70-80% financial value of master LCs. 01 Definition This type of L/C is prepared by the buyer to import goods from the manufacturer. This type of L/C is prepared by the manufacturer to collect raw materials from raw materials supplier for the production. 02 Issued Bank Issued by the buyer’s bank. Issued by the manufacturer’s bank. 04 Purpose To import goods from the manufacturer. To collect raw materials from the Raw material suppliers. 05 Financial Value It has higher financial value than Back to Back L/C. It has lower financial value than master L/C. Accessories are those materials which are not attached to the apparel. It can be explained in other way, accessories are those materials which are not used during manufacturing the garments, only used for finishing and packing the garments. Label i.e. main label, care label, size label, price label and composition label. Salient points of Bangladesh Bank instructions in respect of opening of Back to Back L/C. i) The party requesting for such facility has to be recognized by the Textile Division as and export oriented Ready-made Garment/Specialized Textile Industry and they must have a valid Bonded Warehouse License. ii) While opening import L/C for a new customer the branches must satisfy themselves that there is no outstanding liability of the said Ready-made Garment Industry with any other bank. Request for opening of L/C should not be entertained unless the clients produce “No liability clearance certificate(s)” from other banks with whom they had been doing their banking transactions. iii) A Back to Back L/C is opened against an irrevocable export L/C opened by Buyer’s bank having reasonable period of validity to cover shipment of merchandise after completion of the manufacturing process. The export L/C must be checked and particulars are noted in the register with the L/C opening branch and duly marked lien on the L/C. iv) Import L/C will be opened on usance basis covering usance of not more than 180 days. v) Import L/Cs are allowed to be opened to the extent allowed by the existing import policy. Details of Back-to-Back L/C should be noted on the back of Export L/C. vi) Back to Back L/C may also be opened at sight basis under EDF (Export Development Fund) arrangement. vi) The payment is normally to be made from the proceeds of export bill after realization. The validity of import L/C should not be extended without corresponding acceptable extension of the validity of export L/C. vii) Additional amount for the usance period of import bill shall not exceed LIBOR. i) An undertaking should be obtained from the importer to the effect that in case of non-export within the usance time of the import bill, the payment of import bill would be affected by purchasing foreign currency from the market for which counter-part Taka amount will be placed by the importer from his/their own sources. ii) No remittance under the L/C will be allowed at any stage from the counter’s cash foreign exchange resources other than from the export proceeds. In case export proceeds already realized do not cover import bill amount and the additional amount if any, payable or the import bill falls due before realization of export proceeds, remittance will be considered by Bangladesh Bank against funds from cash. iii) Work/Export order is within the working capacity of the factory and the time available in the export L/C is sufficient for execution of the export order after importing the raw materials from abroad, that the period of work and shipment against subsequent contract/order does not coincide with the work already in hand. Big order for a small industry is highly risky. Available time for execution of the export order may be calculated from the last date of shipment of importable raw materials to the exportable finished product. iv) Shipment schedule for import of fabrics and accessories should be regulated to ensure receipt of both the items at a time in order to avoid dislocation of production resulting in late shipment/non-shipment. i) Failure to execute the export order will cause failure in making payment against Back to Back L/C, which will damage the prestige of the opening Bank of import L/C and this may lead to non-acceptance of our L/Cs without adding confirmation from other Bank. ii) Failure of payment of Back-to-Back L/C liability will also accrue overdue interest. iii) In absence of proper supervision from financing branch, the party may manage to sell the fabrics and other raw materials into the local market and the bank, therefore, may face a lot of problems, as the liabilities of the party are not usually covered by realizable securities because of the prevailing credit norms. iv) Works beyond the normal working capacity of the factory may lead to late shipment or failure in shipment. This may also result in the manufacturing of goods from other garment industries under sub-contract arrangement for which quality may not be as per specification, which may cause a problem in the repatriation of export proceeds. Under such circumstances, the foreign buyer may claim discount which has to be settled with prior permission from Bangladesh Bank after creating Bai Muazzel (Export) liability in the name of the exporter. 2. Salient points of Bangladesh Bank instructions in respect of opening of Back to Back L/C. ii) No remittance under the L/C will be allowed at any stage from the counter’s cash foreign exchange resources other than from the export proceeds. In case export proceeds already realized do not cover import bill amount and additional amount if any, payable or the import bill falls due before the realization of export proceeds, remittance will be considered by Bangladesh Bank against funds from cash. iii) In absence of proper supervision from financing branch, the party may manage to sell the fabrics and other raw materials into the local market and the bank, therefore, may face lot of problems, as the liabilities of the party are not usually covered by realizable securities because of the prevailing credit norms. iv) Works beyond normal working capacity of the factory may lead to late shipment or failure in shipment. This may also result in the manufacturing of goods from other garment industries under sub-contract arrangement for which quality may not be as per specification, which may cause problem in repatriation of export proceeds. Under such circumstances, the foreign buyer may claim discount which has to be settled with prior permission from Bangladesh Bank after creating Bai Muazzel (Export) liability in the name of the exporter. When and why a country prefer exports?